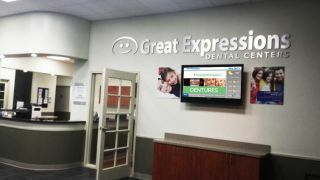 Great Expressions Dental Centers has partnered with 10 Foot Wave to provide Patient Entertainment TV in each of their locations. "We looked at several national providers and 10 Foot Wave stood above the crowd as the industry leader in providing an easy to install and easy to use solution, with outstanding client support," said Ryan Torresan, Vice President of Marketing and Public Relations at GEDC. "Their platform streamlines our in-office marketing and dental education efforts, so that patients learn about dental hygiene care while being entertained with the latest news, sports, and TV content. This enhances the patient experience in our reception area, and creates an interactive experience with live GEDC social media updates on the TV. "Patient Entertainment TV provides patients with a better understanding of their dental health, while increasing awareness of GEDC's products and services, and also promoting a personal relationship with the dental team members. It combines 10 Foot Wave's extensive library of dental education animations and family-friendly entertainment content with GEDC's own branded content.